Panos Kakaviatos and Joanna Simon recommend great white wines from Greece, ideal for drinking this summer at home or abroad. This post has been updated in August 2017 with new wines to try, chosen by expert Joanna Simon. The key to success with white wines in hot countries such as Greece is exploiting cool microclimates. Grapes ripen more slowly in cooler terroirs in mountainous vineyards, developing more interesting flavours as a result. Wines whose labels include the names Mantinia, Amyndeo or Nemea can be good examples. Mountainous areas in Nemea range between 250m to over 1,000m above sea level. Not only do they give rise to variations in wine styles, but they also offer amazing views as one drives through the terrain on sometimes perilous tracks, as I did on a recent visit. Many of the white wines listed below come from cooler vineyards or from vineyards – such as those on the island of Santorini – whose maritime location helps to maintain humidity and to moderate temperatures, with strong winds that blanket the island during the summer, bringing down the night-time temperatures. Situated between 32 ̊ and 42 ̊ north, Greek vineyards are some of the world’s hottest. While this might suggest suitability to the production of red wine, Greece in fact makes a surprising amount of white. Coming from some 65,000 hectares of plantings, more than 60% of Greek wine produced is white: approximately 1.83 million hectolitres of the total 2.9 million hectolitres produced. The best-known Greek white wines are undoubtedly Retsina and Assyrtiko. Retsina is famous for historical reasons, and has an unarguably chequered reputation, long associated with inferior wine often made from a blend of grapes and masked by resin flavours. Assyrtiko is a more recent success story, a grape that today produces world-class dry whites, most famously from old vines grown on the volcanic island of Santorini with its black sand beaches, gorgeous sunsets – and strong winds. Savvy consumers should investigate other white varieties from Greece, including the aforementioned Malagousia, with its attractive orange blossom, stone fruit and floral aromatics. Just before leaving Nemea, I bought a lovely white made from the Moschofilero grape by the Semeli winery, which is both floral and vivacious, and fantastic value – and went down very well with grilled calamari doused in fresh lemon. 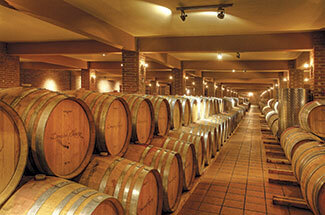 Top producers are also making excellent white wines from international varieties. Try, for example, the Viognier ‘Spilitsa’ Argolida 2013 by Domaine Skouras. This wine’s delectable peach and iodine aspects easily match fine French Viognier for quality. Made from vines planted at a cool 300m above sea level, the Skouras wine exudes both opulence and verve.